If you’re coaching your own son or daughter, the benefits may seem obvious. But there are a host of other reasons to coach youth sports—both good ones and bad ones. Coaching youth provides many benefits including a strong sense of personal satisfaction in teaching young children how to both participate in and enjoy sports. As a coach, I feel rewarded when a young player realizes that they too can contribute and play the sport—when their self-esteem takes a step forward as a result of my efforts. I also enjoy building a team—developing each player’s skills and understanding of the game, and then watching a bond slowly form among them as they begin to share a common goal. More selfishly, I like being part of a team, competing, and staying connected to the child inside me. I also enjoy playing basketball with my former players when they become adults, each of us appreciating the unique community and circle we are a part of. 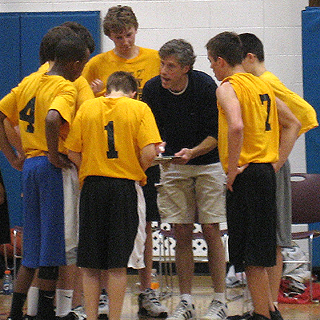 To help you better decide whether youth coaching is right for you, here’s a story that describes my first “big” moment in coaching. As you read the following words, ask yourself how you would feel if you were in my place. What rewards would you take away from this experience? As a town recreation counselor during my college summers, I taught fourth through sixth graders fundamental basketball skills. At the end of the summer, an All-Star game was played between teams representing each of our town’s two parks. On the team I coached was a sixth grader named Chris who was an outgoing boy who loved to shoot the ball and score. But when it came to playing good defense, or expending energy on anything other than the offensive side of his game, Chris seemingly could care less. Although good-natured, he was also lackadaisical. More experienced coaches and parents are probably accustomed to these types of grand statements from young boys. But for me back then, it was all I could do not to burst out laughing at these unexpected and exceedingly earnest words. Besides the humor of Chris’s prospective life commitment, I was also struck by his desire to succeed and willingness to expend all of his remaining energies to help our team win. That moment revealed a noble part of Chris’s character I hadn't seen before. I don’t remember whether our team won or lost the game, but I haven’t forgotten that timeout. To finish the story, I happened to run into Chris years later when he was a young adult. He introduced himself to me, and we talked briefly about those summers in the town park. Before our conversation ended, Chris said, “Mr. Rhoads, do you remember that All-Star game I played in?” I told him I did. He went on to talk about the thrill he experienced playing in that game. Years later, that game still represented a fulfilling moment in Chris’s life—a proud remembrance of meeting a challenge early in life and playing to the best of his ability. Although Chris’s experience came in the heat of an All-Star game, I've many times since seen the same response from players of limited skill engaged in a competitive game. They too have found themselves playing an integral, exciting part in something larger than themselves. They've also experienced the personal satisfaction of contributing to the success of their team, whether it was sinking a shot or setting a screen that freed a teammate to score. And for me, being a part of that experience is what youth coaching is all about. So Coach, "Are you in?" One of the best things about being a coach to seeing a kid blossom before your eyes! I love seeing a player come out of their shells, make new friends, learn they can do something they never though they could and more! That's what I love about youth sports.